An innovative program has been introduced to help drive cost efficient and effective service delivery for the treatment of renal disease in Australia. 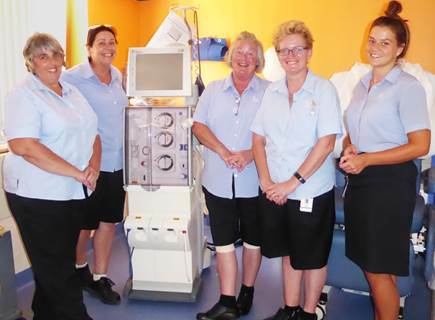 A review of the nursing model at the Flynn Drive Renal Dialysis Unit has created the opportunity to employ Enrolled Nurses under a training scheme to become dialysis competent. The pilot program commenced in February with a second intake planned for May, allowing Enrolled Nurses to expand their skill base and scope of practice. The initiative will go a long way towards meeting the renal service needs of Central Australia with greater mobility of the Renal Registered Nurse workforce across the Central Australia Health Service (CAHS). Enrolled Nurses (L-R) Wendie Hume, Mellisa Walsh, Genevieve Smith, Nathalie de Joffrey and Abby Conry will join the pilot program next month.